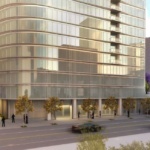 Halprin's Grand-Hope Park to gain 27-story neighbor in downtown L.A. - Archpaper.com Halprin's Grand-Hope Park to gain 27-story neighbor in downtown L.A. 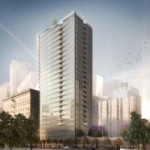 Developer Forest City West and architects Solomon Cordwell Buenz (SCB) have unveiled renderings for a new 27-story apartment tower slated for construction on a site directly opposite the Lawrence Halprin–designed Grand-Hope Park in Downtown Los Angeles. 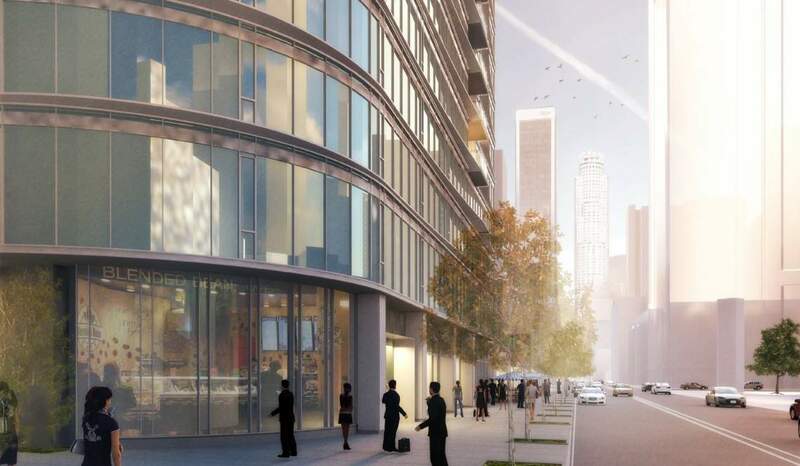 The residential tower—currently known as 949 Hope Street—will feature 236 market-rate apartments as well as 6,700 square feet of ground floor retail spaces, Urbanize.la reports. 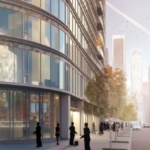 The complex will also feature an amenity deck above a low-rise section of the building’s podium. 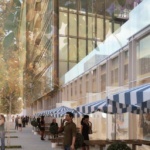 Renderings for the tower depict a glass curtain wall–clad monolith anchored to the street by a low, single-story plinth containing retail and sidewalk seating. 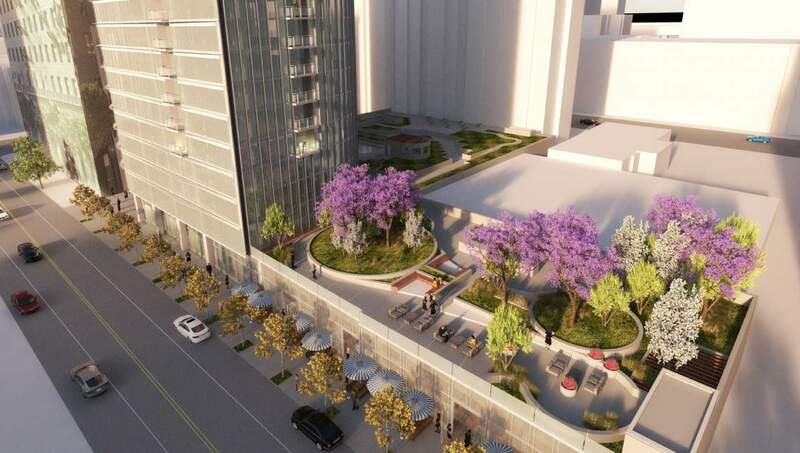 The tower’s base is topped along this commercial wing with an amenity level that is depicted as a rooftop garden and lounge. This level extends behind the tower into the center of the block, where parking and more terrace spaces are located. The building features a rounded corner that demarcates a cut-through walkway along the southern edge of the site and also features inset balconies along each facade. 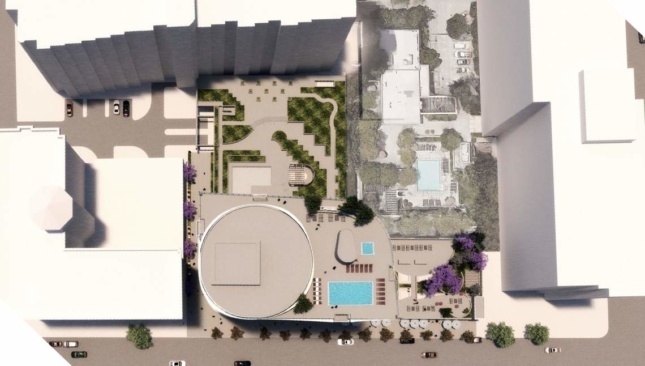 The tower is topped, according to the renderings, with a rooftop pool and a circular indoor lounge area. 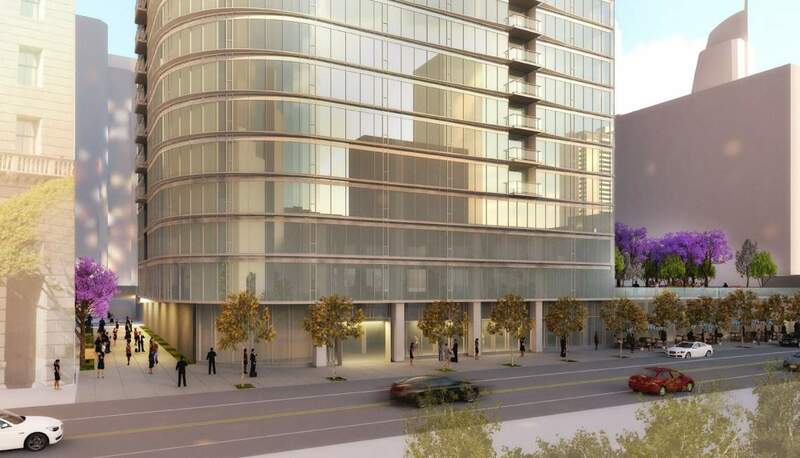 The project is slated for a booming quarter of L.A.’s downtown known as South Park. 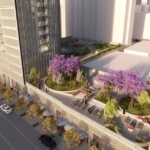 The area is currently ablaze with construction cranes, as the first of upwards of 20 residential and high-end hotel towers take shape in the areas surrounding the Los Angeles Convention Center and L.A. Live entertainment complexes just to the south of the 949 Hope Street site. 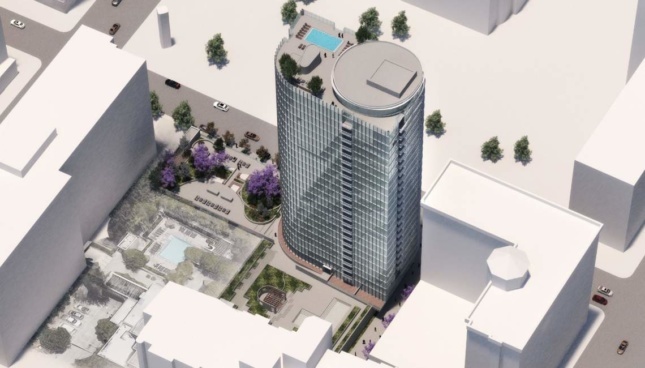 The northern section of the neighborhood—where the proposed tower will be located—has seen a sharp increase in high- and mid-rise residential projects over the last few years, with many more on the way. The area was originally targeted for growth in the late 1980s—with the help of Halprin and developer Maguire Partners—who envisioned Grand-Hope park as the southern cap of a district-wide parks system that would connect residential areas with corporate office towers located several blocks to the north on Bunker Hill. Though many elements of that parks system were never implemented, Halprin’s designs for the bookend parks—Grand-Hope Park to the south and Maguire Gardens at the north—were built and currently function as urban oases amid the flurry of construction. Grand-Hope Park shares a site with the postmodern-style, Jerde-designed Fashion Institute of Design & Merchandising from 1993 and is heavily used by neighborhood residents. There are concerns among park preservationists over whether the mature trees in Grand-Hope park might be singed by the light reflected from the many glass towers sprouting up in the area. 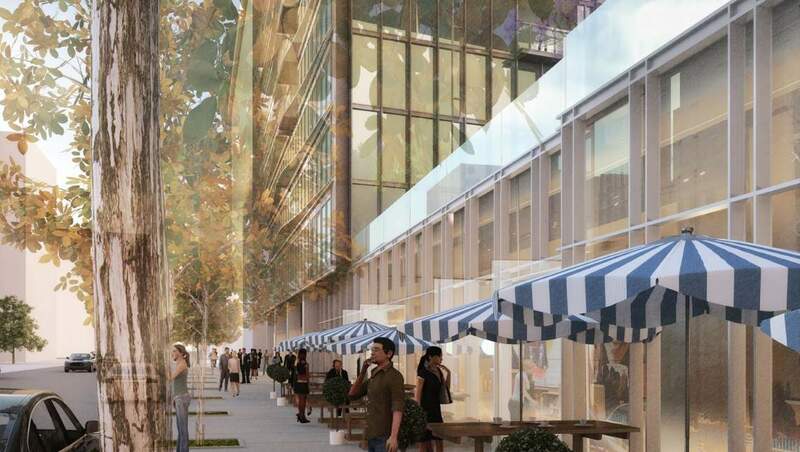 Tellingly, representations of the park are mostly omitted in the newly-released renderings. 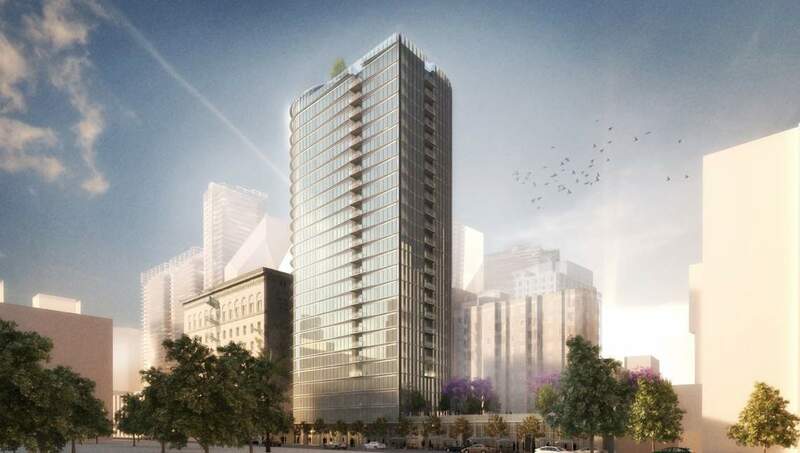 The 949 Hope Street project is slated for completion sometime in 2020.